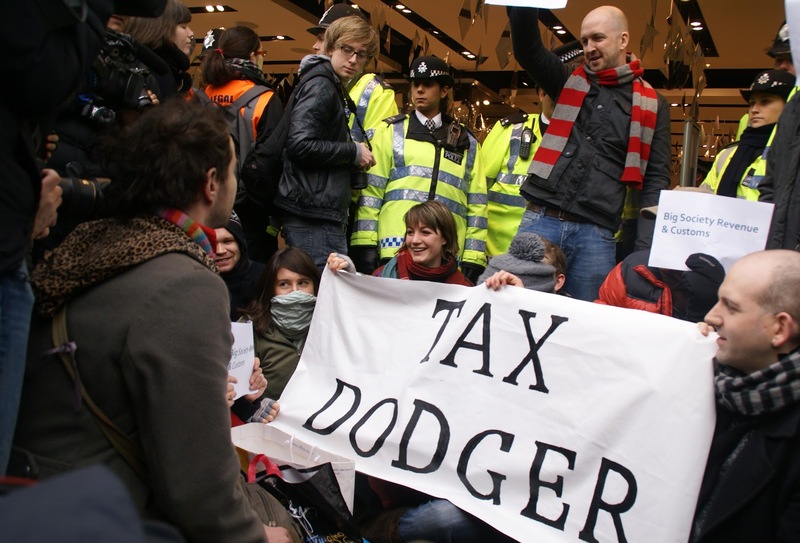 In this post, I’m going to let you into a little secret about tax avoidance campaigners. But I’ll come back to that in a bit. In a week bookended by the Public Accounts Committee’s criticism of Starbucks, Amazon and Google, and UK Uncut’s planned action in Starbucks stores, the usual criticisms of ‘name and shame’ campaigns have been given an airing. Today I want to address a couple of them, to explain why I believe that the campaigns run by NGOs or by grassroots activists are valuable. First, there’s the argument that what’s happening is a ‘witch hunt’, based on ‘understandable misunderstandings’. I certainly think in the last few months what we’ve seen might well count as a ‘moral panic’, and it’s inevitable that during such periods of intense speculation, some individuals will be caught up unfairly in the whirlwind of allegations. We saw this in this season’s other big moral panic, the child abuse scandal. The big false allegation in the wake of the Jimmy Saville allegations did, however, demonstrated one point that I think the critics miss. Few NGOs or newspapers are able to publish allegations without an intense process of libel checking. In my own experience, we kept a large dossier of evidence, which was never published, and spent days before publication cross-checking the specific wording of each allegation we were making against this evidence, on the advice of our libel lawyer. The same process then happened again when the allegations were reported in a newspaper, only this time with the company concerned making very specific challenges to some allegations, which again had to be matched by our evidence, or withdrawn. All of this is with good reason: when the Guardian published in correct allegations against Tesco, the supermarket sued. Starbucks et al might have chosen to do the same, if there were a solid error of factual or interpretation in the stories about them. This is not to say that mistakes don’t slip through the net, and of course it doesn’t allow for how people and organisations without such checks and balances have a tendency to strip away the nuance as they regurgitate the main points of a story. As I’ve said before, I do think that campaigners and journalists – who have the time and resources to check things out – have a responsibility to review others’ allegations critically, rather than jumping on any example that suits their argument. A. Ineffective avoidance, which can be prevented through the courts provided it is discovered and action is taken. C. Using legislation or the international tax system to one’s advantage in a manner which may result in a very low tax bill, but isn’t tax avoidance as such. If the behaviour falls within C, but is considered to be undesirable by the government as advised by HMRC, political groups or others, then the answer lies in policy change and political action, but not criticism of the taxpayers concerned who will have complied with the law. When arranging their tax affairs, multinational companies (and many individuals, for that matter) are faced with a range of options as to how ‘aggressive’ they wish to be. That’s not just a matter of how much they want to push the legal boundaries, it’s also a question of how they want to operate within them. And insofar as a company makes a choice such as this, I think it’s perfectly fair comment for campaigners, parliamentarians and the public at large to criticise decisions with which they disagree. Indeed precisely because category C practices are not a matter of legal compliance, it is all the more important that they are parametrised by a moral framework. As I noted above, I do agree with the critics, including those behind the Oxford paper, who argue that naming and shaming is not the best way to deal with the root causes of practices in categories A, B or C. Because in each case, the root cause is a matter of tax policy or administration. And here’s the secret I promised to divulge: I don’t think that any campaigning organisation that produces or acts on a corporate tax exposé does so because it sees itself in the role of some kind of backstop to HMRC. What NGOs and UK Uncut have in common is that they see the primary problem as the law, and the primary solution as a change in the law. It’s just that case studies of well-known companies are the single most effective way to generate pressure for that change. But isn’t it unfair to single out particular taxpayers, if what you really want is a change in the law? I don’t think so. Firstly, because in a good case study, the company concerned has made a clear choice. That may not be a choice to ‘avoid’ the tax that is ‘due’, but it’s still a conscious choice to arrange its affairs in a manner that results in it paying less tax than it otherwise would. That’s even true if the decision was to apply for an elective tax incentive, or to arrange the actual economic substance of its operations on the basis of tax considerations. I also think there’s a second justification, which is that companies aren’t merely passive rule-takers. They’re intimately involved in the tax policymaking process, whether at the OECD or in the UK Treasury. It’s surely good that taxpayers are consulted in the development of rules that affect them, but I also think there’s some truth to the view that tax lobbyists at times cross a line into having too much influence. Business is working hard to influence the current review of transfer pricing of intangibles at the OECD; recent reforms to the UK’s CFC anti-avoidance rules were developed hand-in-hand with business and following a lot of lobbying. The argument that taxpayers can’t be criticised for merely complying with the law falls down a bit when they were instrumental in its design, too. Treasury minister David Gauke’s past remarks indicate that he sees the need for government, business and HMRC to work together to counter the moral panic on tax avoidance. For me, the most interesting occurrences of recent weeks are the examples that show that this united front is failing. Not only have government ministers spoken out to criticise companies, but both Starbucks and Sainsbury’s have broken ranks: one by making what has inevitably been seen as a de facto admission of guilt, rather than sticking to the defiant line that other companies have held to under fire, and the other by trying to position itself as somehow morally superior to its competitors on the basis of its tax payments. These moves are interesting not because they suggest that companies might start behaving differently, but because they demonstrate that our tax rules are failing in an important way: they are failing to offer sufficient cover to under-fire businesses. That will surely be an important driver of change in those rules: exactly what campaigners are trying to achieve through their corporate exposés.